Snapchat has been added to the Social Follow content block. 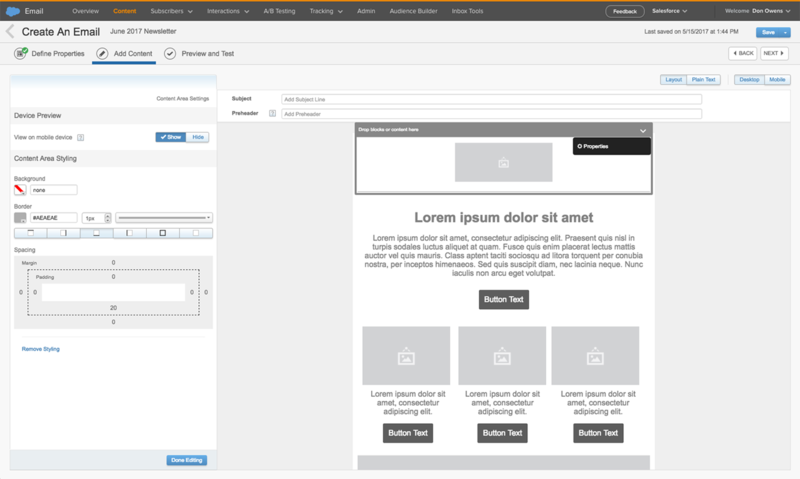 In Content Builder’s templates, you can now adjust your content area styling with a styling editor or HTML. The styling editor appears in the preview. 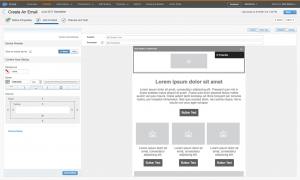 This offers flexibility when creating an email using the out-of-the-box templates. Expanded Mobile Styling Options are now available when editing a content area, content block, or layout, to hide this content when displayed on a mobile device. This is a standard functionality with default templates, but it can also be used with HTML and Custom Templates by adding CSS. How to do this is specified in the help tooltip. Subject and Preheader Validation displays a notification to call out test-related words in the Subject and Preheader of your email. This will help you prevent sending live emails containing these words. By default, the list of words that trigger a warning includes test, draft, and proof. Administrators can configure the list based on situation or language in the Subject and Preheader Validation page under Send Management in Admin. Tracking Status Improvements: Jobs will now use statuses like Scheduled or In Progress rather than Pending. Clicking on scheduled and paused jobs that have not sent any emails will now take you to a simple send summary page. Email Activities in Journey Builder and Automation Studio now support more than 1000 Content Builder folders. This release adds a task-based view of items to review or approve, such as All Approvals, My Approvals, or My Tasks. Submitters, reviewers, and approvers can now reply to a comment left by another user. 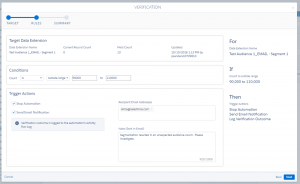 The new Verification Activity helps prevent unintended outcomes that may not trigger an error. 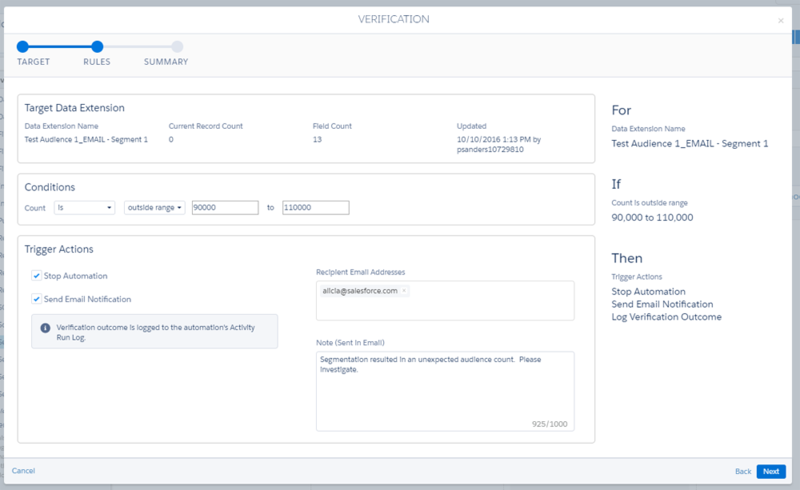 It checks the current record count of a specified data extension: If the record count falls outside a defined range, the activity sends an email notification, stops the automation, or both. Import Activity Setup Guidance ensures that the defined file naming pattern will match actual FTP files. When you select an Enhanced FTP File Location, the system provides a list of files that currently exist in the specified directory. A confirmation message informs you whether or not a current file in the selected File Location matches the file naming pattern. Journey Tags: Organise your journeys with tags that can also link to other Marketing Cloud assets. You can update your entry source configuration prior to activating your journey by clicking the edit button from the entry source tile on the Journey Builder Canvas; Point to a different data extension, update filters, modify the schedule, and change the name of your entry source as many times as you need. Select up to five fields to update on a data extension in a single Update Contact Data activity to simplify your journey. More detailed information on this update can be found here, at the Salesforce website.